KiwiSaver is only going to become more and more important as time marches on. For many it will soon be their second largest asset after their house. I have partnered with Generate KiwiSaver, a NZ owned and operated specialist. Generate have provided a simple 4 question survey to help you find out what you know about the key drivers of KiwiSaver. If you would like a no obligation appointment to discuss KiwiSaver simply enter your details at the end of the survey and I will give you a call. And, for a limited time, if you attend a KiwiSaver appointment with me, you will go in the draw for a $3,000 House of Travel Voucher or one of ten $100 GrabOne Vouchers. If you find yourself on the wrong side of consumer debt and are paying off credit cards, personal and car loans, store cards. Debt Consolidation may be the right product for you. At Advanced Mortgage Solutions we have helped countless individuals manage their debt into more achievable payments, saving them thousands in the process. Debt consolidation enables you to put all of your consumer lending onto your mortgage, pay off the high interest debts and only pay interest at a mortgage rate level, not 19 plus percent. A word from the wise, do not consolidate your debt only to keep on spending above your means. This should be used to help you clear the debt, not pave the way for more spending. Below is a typical example of debt consolidation and the saving in payments that can be made. By clearing the consumer debt and adding it to the mortgage, the weekly payment was reduced from $1113.89 to $186.83 per week. This allowed a saving of just under $1000 per week on original weekly repayment amounts. If you are struggling with consumer debt and would like to find out how debt consolidation can help, please contact us. We now have access to BNZ! I am pleased to announce that Advanced Mortgage Solutions are 1 of only 10 broker firms in Christchurch to get full access to BNZ. As of the 18th of May we will be able to assist with applications for finance for residential, business, or commercial purchases. We will also be able to assist with pricing for any existing BNZ customers who are currently on floating or have a loan about to rollover. This is an exciting time for all of us at Advanced Mortgage Solutions and we look forward to helping our new and existing customers with options from the BNZ. The addition of BNZ now means we have access to all the main lenders in New Zealand and can tailor make a mortgage structure to suit all requirements. If you, a family member, or a work colleague need any assistance with a home loan or mortgage please feel free to contact us. Contact us on 0508 466 356 or by emailing info@advancedmortgagesolutions.co.nz to book an appointment or to workshop a potential deal. The Advanced mortgage Solutions Team. Changes for First Time Home Buyers. Most lenders are now offering an easier way for first-time home buyers to get on the property ladder. You can leverage off your family members’ home equity to get to the required 20% deposit. For some time now that banks have required a 20% deposits from first-time buyers, however the deposit doesn’t have to be completely savings based, which is usually a struggle for many young people with rising house prices. · Equity from a family members’ home. The beauty of this initiative is that your family does not have to give ‘cash’ up front, they simply use the equity they have in their home to help you get a foot in the door. They are also not required to make a mortgage repayments, that’s up to the First Home Buyer. If you want to buy a house that is on the market for $400,000, but you only have $20,000 saved, this house is currently out of reach for you. In the example above I have shown a way of paying the equity part of the loan off at an accelerated rate, in this case over 10 years. If you find that this is too expensive then the repayments can be reduced by paying the equity part over 30 years. To find out more about how this could help you secure your first home, call us today 0508 466 356. If you have any friends or family that may be interested in finding out more please either forward them this email or refer them to us and we’ll do the rest. Are you a “Kiwi” Saver? Last week was Money Week - An opportunity for all New Zealanders to stop and take stock of their financial goals. As a country, our appetite for trying to understand all things financial is a bit lacking and we could all do with being a little more interested and informed and therefore help ourselves to take control of our financial futures. This includes understanding how to structure our lending to make it work for us and reduce it faster, and how we save. As specialist Registered Financial Advisers we are consistently looking to extend our products and services to our new and existing clients without compromising the specialist advice and service we provide.. Along with the recent addition of a Registered Financial Advisor, Bennen Lewis, who specialises in providing risk products, we have all recently undertaken training on providing our clients with class advice in regard to Kiwisaver. We outsource our products we provide which allows us to have variety, options and specialist companies to use that meet our client’s needs best. It was interesting to learn that a larger proportion of Kiwisaver contributors are “parked” in a default scheme, initially set up through their employer. Being enrolled in a scheme, certainly has its benefits but many don’t know that the default providers are limited to seven and that there are other options that once you are enrolled and contributing would be beneficial to consider. Who is your current provider and are they Kiwisaver specialists or a “Jack of All Trades” providing a huge number of products and services to clients by making it easy to have everything in a “one stop shop”? Is my provider proactively or passively managing my investment? What are my provider’s service, fees and returns? What fund am I in and does it suit the type of Investor I am? Is my fund provider New Zealand owned and operated or offshore? Does my provider offer a life stages option where my investment fund is changed based on my age? Do I understand that my Kiwisaver funds are held by Public Trust, as Supervisor of your investment no matter my scheme? How many of us have opted in and simply forgotten about it? Taken the following statistics it is something we shouldn't have! Both investors start saving at age 20 on salaries of $30,000.00 pa each and remain employed until retirement age of 65. No withdrawals are made. The employer’s contributions are net of employer’s superannuation contribution tax at current rates. The election result is now known and the status quo remains with pre-election nervousness disappearing. This should inject some confidence back into the housing market as things such as a capital gains tax are not likely to come to fruition for the time being, and those that were waiting to see what happened can now move forward. There was a pre-election lull in relation to new home consents and market commentators are expecting activity to pick up before the end of the year. Strong demand for homes in Auckland and Canterbury are expected to drive demand for the building sector in the next couple of years. It is interesting to note a rise in consents for new apartments. These consents have risen form 4% in 2010 to now make up 12% of total consents. This figure is buoyed by growth in the retirement village sector. The Auckland region as a whole saw residential property values increase by 1.8% over the past three months and 10.3% year on year. Whilst values are still rising, the rate of growth has decreased significantly, probably due the effect of the winter and the build up to the election. Spring traditionally provides buoyancy back to the market with increased listings and buyer interest. Residential property values in Hamilton City decreased by 0.9% over the past three months, however they have increased 2.7% year on year. In Tauranga City home values have remained stable with a 0.0% change over the past three months but they have increased 4.5% year on year. The Tauranga market benefits from migration from Auckland and Christchurch. Home values in the Wellington Region are still showing a slight downward trend, decreasing 0.9% over the past three months and values across the region as a whole are up only 0.3% since September last year. In Christchurch City home values have increased 0.3% over the past three months and they are 5.1% higher than in August last year. Home values in Dunedin City have increased by 0.3% over the past three months and 1.7% year on year. Values in the provincial centres are variable while many are decreasing or flat and there are a few areas where residential property values have increased. Fonterra’s lower dairy pay out may have an impact on the housing market in the provincial areas. Wouldn't it be great if we knew the perfect thing to do each time we were faced with a major decision that affects our lives! Just like the looming election where we need to make a choice, at times we feel unprepared to do so and simply therefore, go for what's familiar, comfortable and easy without really investigating the fine print, the big picture or where may find ourselves in a few years. Buying a home, business or business premises and borrowing a substantial amount of money is another one of those major decision making processes where having the right knowledge and information can make what can be a stressful time feel much more manageable. Traipsing in and out of of financial institutions, comparing products, policy and pricing has never been said to be a quick process let alone an enjoyable one for those on the hunt for a home, yet it's something that simply needs to be done to make sure that your bank's offering is really up with the market and looking after you and that's where we come into play. We do the walking, talking, negotiating and sorting for you and after careful analysis based not only on your short term but long term financial goals, we then make the big decisions together that sit and fit well with you going forward. Empowering and educating our clients by offering our in depth knowledge of many lending institutions is what we do best. Align this with exceptional service, no cost to you and our friendly down to earth approach we make what many see as a necessary time consuming chore more efficient, time and money saving and definitely tailor made. Next time you or someone you know is about to start the journey of finding the right finance, we are the right place to start to make those decisions, decisions, decisions easier. Advanced Mortgage & Insurance Solutions - Make a great decision! With the election looming there has been a lot of commentary on support for first home buyers. This is developing as a major election issue as the parties strive to capture the younger voter and address the passion we have for home ownership. National says that it backs young Kiwis who are disciplined, save up and want to put a deposit down on a property. National values home ownership because it provides stability for families, strength for communities and security in retirement. Their policy focuses on changes to KiwiSaver. 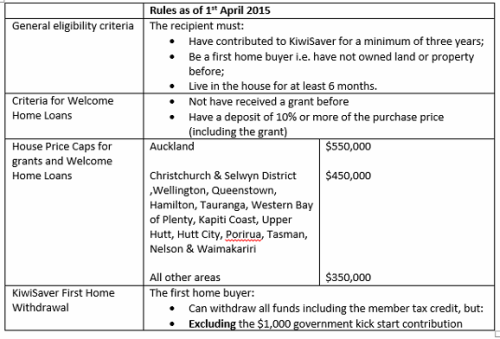 The First Home Deposit Subsidy would be replaced with a KiwiSaver HomeStart Grant. This is a similar scheme, but has higher house price limits, and doubles the support for people who are buying or building a brand new home. National will allow people to withdraw more money from their KiwiSaver account to use as a deposit on their first home. First home buyers will be allowed to withdraw the Government’s annual contribution to their account – the member tax credit of up to $521 a year – as well as their own, and their employer’s, contributions. Finally, more people will be able to get Welcome Home Loans, which means they require only a 10 per cent deposit to get a government-guaranteed loan. This will be achieved by making the Welcome Home Loan house price limits the same as those for the new KiwiSaver HomeStart Grant. Labour says it recognises the need to act urgently to address the critical shortage of housing supply and housing affordability. They say there is no single way back to affordability and owning our own future in housing, but turning current trends around and starting down the right track is essential. They recognise that the biggest barrier to home ownership is the difficulty of getting on the first rungs of the housing ladder. One of the main reasons housing is unaffordable is the lack of new entry-level houses. They quote the 1960s and 1970s, when homeownership was on the rise and 30-35% of the new houses built were entry-level homes. Today, that proportion has fallen to just 5%. Labour plan to build 100,000 starter homes over 10 years for first home buyers with an emphasis on Christchurch, reform monetary policy to lower interest rates, and crack down on property speculation through a capital gains tax and restrictions on non-resident purchasers of New Zealand houses. In reforming monetary policy Labour wants to look at ways of introducing long term fixed rate mortgage products. The minor parties also have housing policies to encourage home ownership. Whichever way our parliament is made up after the election, it is good to see that first home affordability is being addressed as a priority. Let’s hope that the pre election hype turns into policy that can be implemented to make home ownership a realistic goal for first home buyers. With the approach of the general election the housing market has adopted a wait and see approach. Potential buyers want to have certainty before committing themselves. Home values in Auckland, Christchurch and Tauranga are still increasing but at a slower rate than this time last year. The Auckland region as a whole saw residential property values increase by 1.8% over the past three months. Residential property values in Hamilton City have decreased slightly by 0.2% and over the same period residential property values in the Wellington Region still showed a slight downward trend down 0.5%. Residential property values in Christchurch City have increased 1.1% over the past three months and in Dunedin City they have decreased slightly by 0.4% over the same period.